For millions, this will be a storm to remember. From Minneapolis to Marquette, Michigan there is a potential that this snow could last the entire winter. We are heading into a pattern of well below normal temperatures after this storm passes. The cyclone is still developing in Rocky Mountains and will begin to emerge later today and pass through the Midwest Monday into Tuesday. Much of the area is under winter storm watches and warnings in anticipation of heavy snow that will alter usual travel. 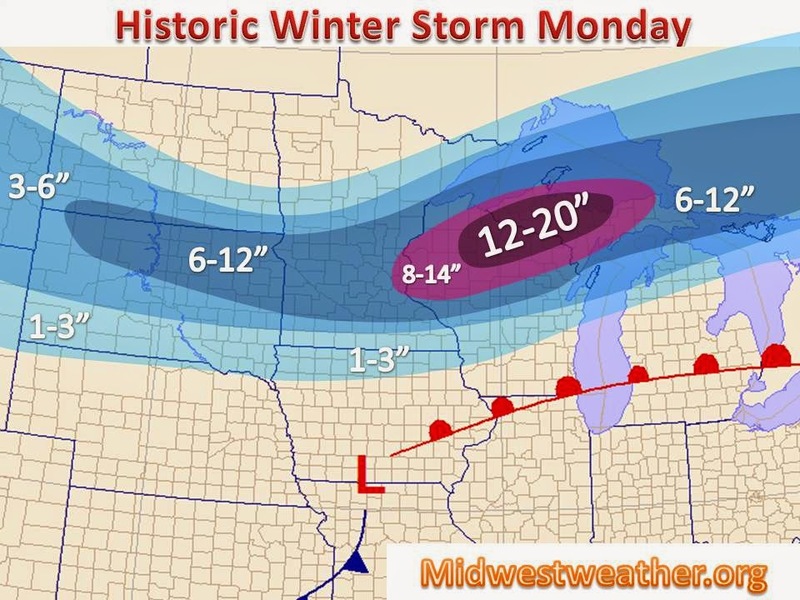 From central Minnesota to northern Wisconsin, school will certainly close Monday and/or Tuesday. Confidence is very high on the track of the system and the intensity, as every major computer model has now sampled the system as is pushed on shore this morning. All of the solutions presented by the models are extremely similar and only very on a track of 5-15 miles. The sharp cut off in heavy snow we are forecasting does not make for an easy forecast, as 10 miles will have a major difference in how much snow falls. Any necessary tweeks to the forecast will be posted on Facebook and in a new post on this site. By Tuesday, over a foot of snow will have fallen in northern Wisconsin, which will set up for a cold week ahead. Any nights will clear skies and light winds will feature temperatures near zero where a significant snow cover is now in place. In summary, winter is here and will stick around for awhile. Many snowfall records will certainly be broken by Tuesday. Take it easy if you plan to travel in the effected area, and keep it here for continued updates on this winter storm and the winter to come.